Sell My Car in Derby – We Want Any Car Makes It Quick and Safe. No one understands how tedious, expensive and time-consuming selling your second hand car privately can be, but at wewantanycar.com we take care of everything for you. You will not find a more efficient and inexpensive quick way to sell your car. Get started by entering your car’s registration details into our online valuation tool. We’ll use this to find your car and then ask you some questions about mileage, condition and service history to help us make an accurate valuation of the vehicle. Provide us with your contact details and our team will be in touch to let you know how much your car is worth. This is all free of charge and there is no obligation to sell the car to us afterwards. If the valuation is acceptable then we need to book you an appointment at your local branch. You’ll find the Derby office just outside the Pride Park Stadium. It is not far from the city centre with good transport links to the A38 and A52. 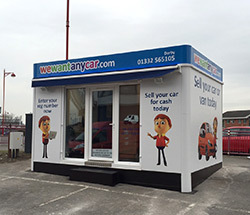 Start the process to sell my car Derby by contacting Adrian on 01332 565105 or by email at derby.city@wewantanycar.com. Honest quality service. And accomadated my time conflicts. Ellis was an excellent ambassador of your brand. Efficient and fair assessment. Ellis at Derby was excellent to deal with. Amount I walked away with was fair and Martin was extremely professional, friendly and honest. Although I didn't write get the price I wanted, I thought Pantelis at the Derby branch was a really great guy, extremely fair and helpful and sympathetic with my sensitive situation, which I appreciated. Easy and quick service and they offered me more than we buy any car.com did. Would recommend to anybody wanting a hassle free sale. Doing good business is about working with good people, no reservations, I would recommend Wewantanycar to any one.. especially if they visit the Derby Branch and deal with Pantelis Constantinou.